2:15 PM Many of you, I know, are currently struggling with how to carry out your convictions about New Testament ecclesiology. I should know: I receive many of your emails. Believe you me, I share the same struggles. Let me offer a brief word I hope will help us all. I have discovered through the years that there are two types of knowledge. The first is knowing WHAT. That is, before we can pursue a biblical ecclesiology, we need to assemble facts together. These facts come from the Scriptures, not from any man-made traditions. As we search the Word of God, we are confronted with the truth, with basic facts about church life. Of course, many evangelicals have never even taken this first step. They remain steeped in their traditions because they have never considered what the New Testament has to say about the church. The second kind of knowledge is knowing HOW. That is, even if we know (or think we know) what the Bible teaches about church life, there remains the enormous task of actually en-fleshing this knowledge in our daily lives and in our congregations. This is a completely different kind of knowledge than just knowing the facts. This knowledge cannot be gleaned directly from the Scriptures. We gain this knowledge through the leading of God's Holy Spirit, who enables us to move ahead by showing us the concrete steps we should take and, just as importantly, how and when we should take them. This takes a lot of discernment, and this discernment can only come from God, just as truth comes from God. As a history buff, let me an offer an analogy from the 1860s of what I am trying to say. When Union General John Buford arrived at Gettysburg around noon on June 30, 1863, he already had a general idea of the terrain. 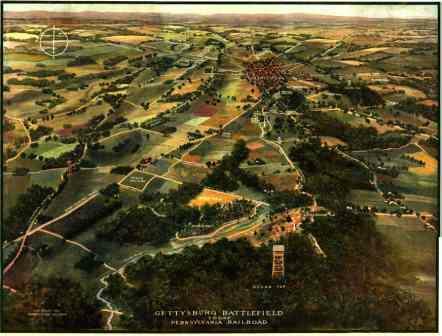 A glance at his map revealed that Gettysburg was a vital road junction. He knew that whoever controlled Gettysburg could out-maneuver his enemy. He knew all of this intellectually. But once he arrived on the scene he had to move from a two-dimensional world of a map to a three-dimensional understanding of the actual terrain. And, as all students of the American Civil War know, by choosing to defend McPherson's Ridge, Buford and his First Cavalry Division were able to hold off the attackers until the Union Army arrived. "The map is not the terrain," is how a military instructor at West Point might put it. And so it is in the Christian life. Change -- all change -- begins with the renewing of our minds as we study the pure Word of God and begin to wean ourselves from worldly or non-biblical traditions. But then, as we move from intellectual comprehension to practical implementation, we must also move from map to terrain, as it were. We are now "on the spot," "boots on the ground." We are forced to make judgment calls. We have to decide such questions as where, when, by whom, and how fast (or slow)? There are no set answers to any of these questions! At least I haven't found any. Certainly, if the church is to be the church, all of us must move from the map to the terrain. But therein lies the rub. And that is precisely where so many of us struggle. My hope is that as the Lord Jesus leads you along this wonderful but sometimes frightening journey, He will keep you challenged and occupied with healthy, positive, and happy thoughts and deeds. And please remember: If I can be of any assistance to you in your journey, I stand ready to do so to the best of my ability. America, we cannot turn back. Not with so much work to be done. Not with so many children to educate, and so many veterans to care for. Not with an economy to fix and cities to rebuild and farms to save. Not with so many families to protect and so many lives to mend. America, we cannot turn back. We cannot walk alone. At this moment, in this election, we must pledge once more to march into the future. Let us keep that promise — that American promise — and in the words of Scripture hold firmly, without wavering, to the hope that we confess. This is bad theology, very bad theology. Obama misapplies the Scriptures, as did Bush when he said that the "wonder-working power" was the American people instead of the blood of Christ. The hope we confess, Mr. Obama, is not the "American promise." What is it, you ask? Read the book of Hebrews, especially Heb. 10:23. 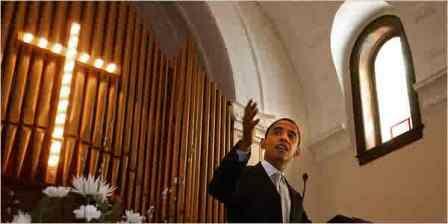 Republicans, I think you've met your eisegetical match in Mr. Obama, the Democrats' new theologian-in-chief. Religion is the most dangerous energy source known to humankind. The moment a person (or government or religion or organization) is convinced that God is either ordering or sanctioning a cause or project, anything goes. The history, worldwide, of religion-fueled hate, killing, and oppression is staggering. The biblical prophets are in the front line of those doing something about it.... Prophets see through hypocrisy, especially hypocrisy that assumes a religious pose. 9:25 AM I have some wonderful news to report. Becky just spoke with our son David in Alaba. Our brother and sister who were imprisoned have been released! Your prayers, friends, made the difference I'm convinced. May God fill our hearts with gratitude for this fresh deliverance. Now let's pray that they will continue to remain faithful to Jesus. The church is alive and well in their small village. Which means that the opposition by the enemies of Jesus will only increase. (Of course, "they know not what they do." The real Enemy is not flesh and blood.) The believers will meet with difficulty upon difficulty. 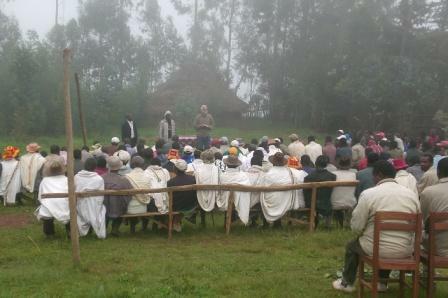 Still, we rejoice together with the church in Alaba, Ethiopia today. And let's continue to pray for them all. They need to be upheld in faith and every other grace, just as we in America do. 8:55 AM Politics -- a glorious distraction? 8:28 AM The latest addition to our home page is called My Life's Goal. 8:23 AM Alan Knox on how to have a true worship service. 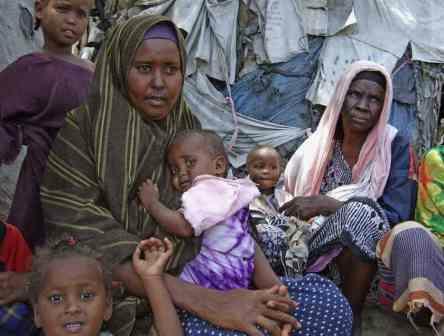 8:20 AM The heart-breaking tragedy of Somalia is spilling over into Kenya. May God help these desperate people. 8:13 AM Here are the places in Texas where Becky and I are scheduled to speak this coming week. Should be great fun! Please let's all be praying for the Spirit to move during these times. The Book of Acts has only 27 chapters of "acts." The first chapter is dead quiet -- just the people of God waiting for the Spirit's fullness, without which there would have been no church, no ministry, no mission, and no "Book of Acts." The work in Ethiopia is the Lord's work from start to finish. Becky and I want nothing more than to conscientiously recognize and practice His lordship. May it be said at the end of each of our meetings: "To Him be the glory in the church and in Christ Jesus throughout all generations, for ever and ever! Amen" (Eph. 3:21). 9:31 AM Here's something from the vault for all of you starting seminary for the first time. 9:22 AM The Lord sent us even MORE rain last night. Grosses hast Du uns getan/Alles in uns betet an! 9:14 AM Becky and I have been rereading The Cost of Discipleship. Mark has just posted a letter from Bonhoeffer to Eberhard Bethke in which Bonhoeffer makes this profound observation: "Gott ist mitten in unserm Leben jenseitig." I have to agree totally. God is with us always, but there is always a "respectful" distance between God and man. When I was involved in the Jesus Movement I recall often referring to the Savior as "Jesus." And then I read the Gospels. The followers of Jesus, those closest to Him in fact, never referred to Him so intimately. He was always "Lord" or "Master." Beyond -- in the midst! I don't understand this concept fully, but I believe it's true and thoroughly biblical. Yes, He is Jesus (mitten in unsrem Leben), but He is always Lord (jenseitig). Amen? 8:55 AM Bro. Lionel thinks seminaries ought to offer courses in the doctrine of the priesthood of believers. Sounds good to me. It was about a twenty yard walk.... I was in full uniform, such as it was, and long before I reached the news vendor, the attention of the crowd on the platform was focused on me. I had been recognized as a British airman..... The paper seller was standing there frozen, watching my approach. "Je voudrais les journaux et quelque revues." "Mais oui, monsieur le commandant. Avec plaisir." "Mais rien du tout, mon commandant. C'est le moindre que je puisse faire." I felt he meant it and for a weak moment I was so touched I felt near crying. "Je vous remercie, monsieur. Vive la France." Alright, you French scholars out there. Could you understand the conversation? Simple, eh? And a pure delight! I love books that assume a knowledge of foreign languages. Reminds me of the first time Becky and I visited Paris. It was late summer in 1978. We had just finished serving in Germany with Greater Europe Mission's Eurocorps Team. The team members had split up into various groups, and now we were to meet at the European Bible Institute, situated on an estate in Lamorlaye in northern France. Becky and I arrived in Paris from Basel late at night. Somehow I had to find a train going to Lamorlaye. Using my pidgin French, in which I was crudely fluent, I discovered that we were in the wrong train station. I had to get us from where we were to the Gare du Nord (pictured below). At about midnight we lugged our heavy bags through the streets of the city (we had no money for a taxi), asking directions several times. Finally we arrived at the station and got our train, which deposited us at a small station far out in the countryside. A sleepy taxi driver told us where the château was, and off we went on foot. 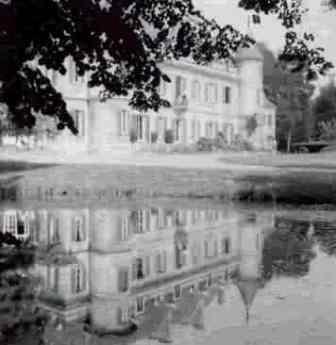 It was about three in the morning when we finally arrived at the monstrous estate (see photo), whose gates were securely locked. What to do? Sleep outside under a tree, of course. We nearly froze that night. The prim and proper housekeeper, when she saw two disheveled Americans in the morning, practically died of shock. Becky and I still laugh at this story today. I tell this tale for two reasons. One, you never know when your French will come in handy. Two, I want you to know that Becky and I have always been crazy, even long before we started doing nutty things like going to out-of-the-way places in Ethiopia. Ed’s been working day and night on researching the right products, tweaking this and twacking that, so that everything works together well. Have you ever planned such technology for a new clinic on the other side of the world? There no Home Depots or Lowe’s Warehouses anywhere in Ethiopia! Ed must think through every little thing about this project, making sure we get the best financial deal, making sure the equipment will tolerate the Ethiopian environment, making sure all the little pieces are accounted for. After months of work, he is now ordering the equipment. And we are beginning the research on shipping. Please be in serious prayer for Ed and me these days. It is the Lord’s work, and He is fully able to care for things that pertain to His Kingdom. But we must be diligent, and there are many other responsibilities on our plates besides the clinic. Also, please be in special prayer for the funds needed for this project. We’re looking at about $8,000 just for the equipment, and another $4,000 for the transport of the equipment to Addis. Isn’t it “fun” to watch the Lord do His work! You can tell people anywhere around the world that they can give to the clinic offering on our website at that link. Our on-line giving company is legit and has the highest on-line security rating….. If you think it would be helpful to give some of your other supporters the opportunity to give to your Ethiopian work via this on-line function, you are welcome to pass it along. Any givers will be mailed charitable contribution forms from NEHBC come January, 2009. The on-line giving function to the clinic will be available on our website through Sept. 19. …100% of any money given at the on-line location will be given to you for the Ethiopian work. So our Lord has given us this help for this time. Anyone may do on-line giving through NEHBC's special Ethiopian Clinic offering! (But only through Sept 19.) You do not need to be a member of their church…it is open to anyone wishing to participate, and they will send you a tax-deductible receipt. Check it out at www.nehbc.com. Amid all the debates over Calvinism and the King James Version and the emerging church and worship styles I have come to a slightly different realization: that God is calling out a people who are committed to living lives of genuine obedience to Christ, a community of faith that functions in Christ-like ways – visibly, voluntarily, sacrificially – to show people this thing Jesus called the kingdom. Folks, Ed Johnson is living out the kingdom like this. I have little patience with people who argue constantly about their views on church polity or the synoptic problem or textual criticism. What is your number one priority? I'll take a dozen like Ed over a thousand who wallow in their latest "cause." It is my strong conviction that Christian students, at least, should resist the temptation to reduce theology to purely theoretical explanations. I have no greater respect than for men and women who work full time jobs and yet relentlessly, selflessly, sacrificially pursue the kingdom. Ed has been a great example to me of such a person, one I would do well to emulate. At any rate, please do pray for Ed -- and Becky. Their plates are very full! 8:58 AM The latest addition to our home page is called My Fight. 7:40 AM The rain falls steadily this morning. We are grateful for every drop. If the Lord gives us a few inches during this storm we may be able to get up a second cutting of hay this summer. It's all in His hands, and He can be trusted. But right now the hay is much too brown to cut. And here's a shout out to my students who stopped by yesterday to chat. I enjoyed seeing each and every one of you. For those of you who inquired about the Greek Syntax and Exegesis course I'll be teaching next spring, ask me for a copy of the syllabus next time I'm on campus. The only thing I haven't finalized yet is whether we'll be exegeting Philippians or 1 Thessalonians. (I'm leaning toward Philippians.) But the textbooks will be the same as before. If you do decide to postpone third semester Greek until the spring, you'll need to keep up with your Greek in the meantime. One of our textbooks, It's Still Greek to Me, might help you do just that. Today and for the next few weeks in fact I'll be extremely busy, right up to my departure for Central Asia. I've got to finish writing several lectures I'll be giving during my sabbatical travels. In addition, Becky and I leave this weekend for a trip to Dallas/Houston, meeting with congregations that have expressed an interest in Ethiopia. Already it's a busy sabbatical, which is how I like it. My latest book manuscript on discipleship is finished, and I've got only one other set of page proofs to pour over: my Greek grammar revision. I can do that while traveling -- a good use of airport layovers. Because of the rain we'll have to postpone outdoors work for a while, which is probably a good thing. My back needed a day off. Nate and Jessie have been keeping busy, though, remodeling their parlor. They got the wall paper up yesterday and it looks fantastic. Kudos to them! 7:34 AM Why cattle graze facing the same direction. 7:30 AM A growth skill set for pastors. 7:25 AM Roger Thoman on Comfy Christianity. 6:22 AM Off to school. 6:17 AM Odd. I find myself using the term "Christian" less often these days. Not only because it is not really a New Testament word for followers of Christ. (The earliest Christians preferred to be known simply as believers or as followers of the Way). But also because Christianity involves not just orthodoxy but orthopraxy. It's talk PLUS walk. Karl Barth once said the best apologetic is good theology. I disagree. I'm with Kierkegaard when he said that the best apologetic is living a life in accordance with the truth of theology. That's what being a true "Christian" involves. Call it "Christianality" if you like, but it works (in both senses of the term). 6:12 AM Yesterday Nate and I moved two 32-foot floor beams from Oxford to the farm. Yes, I said 32 feet long. Uncut. I still don't know how we managed to get those beams on and off the trailer. To say that I am still "feeling it" is the understatement of the decade. The beams were hand sawn over 200 years ago. I imagine the pine tree from which they were cut began growing around the year 1750 or even earlier. And yet the beams seem like they were sawn yesterday. You should see how straight the grains are. Man, do I enjoy this work. 6:05 AM Hi, everyone. My name is Galana. I'd like you to meet my new family. Mr. and Mrs. Glass are wonderful people. 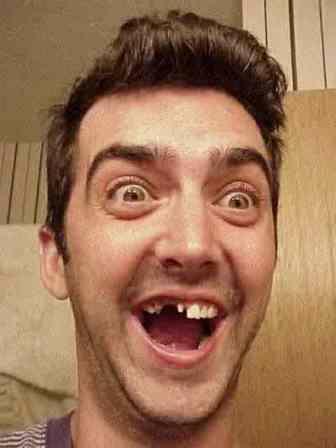 They live in Roxboro, North Carolina. Mr. Glass helps people become more like Jesus. Mrs. Glass has three wonderful children to care for. They will be soon be my playmates! I am named after a small village in a place called Burji, in southern Ethiopia. It is very far away from the capital of Addis Ababa. So far away that very few people ever to come to visit it. But the Blacks and their friends have come to visit it many times. And guess what? Mr. Glass himself will come and visit Burji in November. He is going to teach men about the ways of Jesus. Mr. and Mrs. Glass's church family in Roxboro has a big heart for Ethiopia. Many of their members pray every day for Galana. Here is a picture of the house in Galana where the Jesus-followers meet. I think they pray for people in America too. 7:56 AM Students, I'll be on campus tomorrow. You can email me to make an appointment, or just show up. I'll be there most of the day. Today it's back to salvaging lumber. 7:45 AM Meet the Rondeaus: Matthew and Liz, plus their sons Caleb, Isaac, and Micah. They are not only part of our family; they are excellent puppy namers. Each Rondeau got to pick a name from an Ethiopian water jug and then assign that name to one of our puppies. All the names are taken from villages in Ethiopia. Shargo is located in the Burji region. Nate clowning around. Who'd he inherit that trait from anyway? How do you celebrate a puppy naming? By eating Ethiopian food, of course. And it tasted yummy, too. As Jessie put it Saturday at the Ethiopian restaurant, "Mom, I like your Ethiopian food much better." In true Ethiopian style, we ate with our hands. You'll notice which end of the table got the bigger platter. Our meal was polished off with ice cream and an apple concoction Matthew dreamed up. Good to the last drop, says Micah. Then it was off to watch Uncle Nathan fire up old Hercules. Here's what they were watching. Well, would you like to meet the pups? Here's Deda. 7:45 AM The latest addition to our home page is called Jesus Or Julius? 7:37 AM Yesterday Becky had a sewing lesson down in Raleigh, so we took advantage of the long drive to eat at our favorite Ethiopian restaurant. We enjoyed several kinds of "wats" (stews), including my favorite, doro wat (chicken stew). A trip to Dairy Queen was the perfect topper to a perfect day. This afternoon we'll be eating Ethiopian food again. This time Becky is preparing it (she's an excellent Abyssinian chef). The occasion? We are naming the puppies. The Rondeaus will help us celebrate this auspicious affair. 8:26 AM Hey, fellow pilgrims! Here's something to do today if you have a spare minute. Go to your church's website and see who in your church is mentioned first. My guess it's gonna be the leaders (elders, pastors, staff, etc.). There will probably even be a nice photo of your pastor. Think about that. 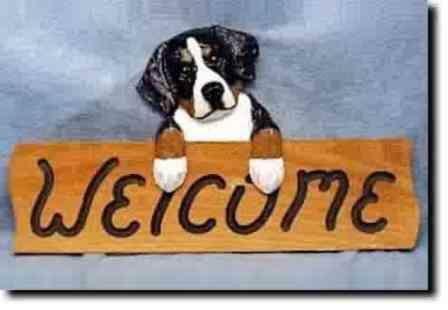 What is that telling visitors to your site? That the people who count first and foremost are the "ministers." But if we're all ministers (as the New Covenant clearly teaches), why not highlight what the so-called laity are doing? For example, you could mention how brother so-and-so is visiting the nursing homes, or how sister so-and-so is working in the local food pantry, or how the congregation is having a prayer meeting for missions, or how this family is passing out tracts, or how people are getting together during the week for fellowship and Body-building. Put their pix on your home page, rather than your pastor's. Why not revamp your home page to make it a little less top-down and a little more bottom-up? You know, sort of like Jesus (Mark 10:45) or like the way Paul greets the saints in Philippi first, and then mentions their overseers and deacons, almost in passing (Phil. 1:1)? Come to think of it, in most of the openings to his letters he doesn't mention the leaders at all! 8:12 AM Bryan Elliff (age 18) wants to ask young people a question: Do you want to be cool or a fool? I thank God for all you teenage fools out there! 7:32 AM Becky's been working very hard in preparation for our trip to Dallas and Houston that starts next Saturday. Next week I'll post an itinerary in case you would like to consider joining us at one of the several venues we'll be speaking at. We'll also get to enjoy the company of Becky's mom and dad for a few days and attend the church in Dallas in which Becky grew up and in which we were married 32 years ago. God is blessing His work in Ethiopia tremendously. The Lord pours in, while His people in America pour out. We marvel at His goodness to us. We thank Him for every partner in the work. We praise Him for every gift, large or small, for the Ethiopian ministry. We appreciate every kind and refreshing email we receive. We thank Him for every American who is willing to come with us to Africa. They not only profess to trust Jesus, they actually follow Him in the lowliest paths of service. The Lord continues to allow us to see fruit in connection with the work in Burji, Alaba, and Gondar. Please accept our grateful thanks for your love for Ethiopia and for the Ethiopians. Seeing the vast field before us, I am convinced that God is not finished with His work in that great and needy land. More than anything, my mind boggles to think that Jesus should allow us to love these people, and be loved by them. Wow! 8:47 PM Today was one of those perfect summer days you never forget. After my morning prayer time I updated the blog then cooked pancakes for everyone. We needed high energy food in view of the work we had planned for the day. It's now after 8:00 pm. I've just scarfed down some of Becky's delicious spaghetti. 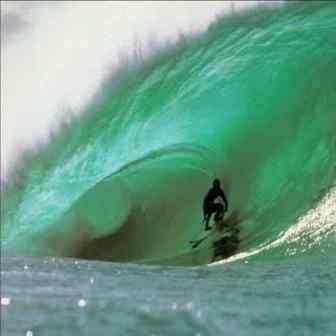 I feel exhausted yet exhilarated at the same time, as if I had been surfing the North Shore for 5 hours. I thought I'd post a few pix of today's excitement. Care to join me for a brief walk down memory lane? Our main goal today was to continue tearing apart an old -- and I mean OLD, as in 1780 -- house down in Granville County, NC. On the way there Nate had to deliver some shutters he had repaired. He installed them in this classic beauty built around the turn of the century. How this odd job came about I have no idea. A friend of a friend of a friend told someone about this craftsman named Nathan from Virginia. The house contains many items of interest. This sofa was built by Thomas Day, which makes it a very valuable and historic piece of furniture. Note the petticoat mirror at the bottom of this antique parlor piece. The house also has a magnificent library. On the shelf I found, to my great excitement, a copy of the 1856 edition of Liddell and Scott's Greek-English Lexicon. In pristine condition, too. Neat. Next door stands the town's old Episcopalian church, which is no longer in use. It was built, we think, in 1888. The old doors are particularly impressive. Actually, the doors are replacements made by Nathan a couple of years ago. I'm told that no one who tours the church can tell the difference. They sure look original to me. Then we finally arrived at the job site. Our task was to salvage the sheathing boards, rafters, joists, and floor beams. It seemed strange to me to be tearing apart a house that had been so meticulously constructed over 200 years ago by master craftsmen. Jessie's job? She's the best nail-puller-outer you've ever met. We're saving all the 1780 forged nails for a rainy day. We took a break for lunch around 1:30. Here we are, having put away a giant meatloaf sandwich, melon, grapes, cookies, and a soda, courtesy of Becky and Jess. With these floor joists our work for the day was complete, as our trailer was loaded to the gills. Here's the load we lugged back to Rosewood Farm this afternoon. Not bad for a day's work, eh? And we've only just begun. I walked back to my house from the Blacks. This is a sight I never tire of. "Be it ever so humble...."
Sheba had just fed her pups, so they were all sound asleep on a full tummy when I arrived home. Becky, however, was bright-eyed and bushy-tailed and eager to show me her quilt. She finished it today. Isn't it a beauty? Becky will present it to her mom personally when we arrive in Dallas next week. I've no doubt at all that Mrs. Lapsley will love it. Thus concludes "A Day in the Life." Thanks for watching! All right, now. Who'll be first? 6:52 AM I see I'm not the only teacher of New Testament and Greek who opposes American imperialism. 6:45 AM Today I'm off to Carolina to help Nate and Jess with a project. You see, they can only go so far before they need to call on dear old dad for his wisdom, dexterity, and expertise in all things practical. Actually, I'd do almost anything for them, even shamelessly pulling nails or just standing around on call to "go-fer" this or that. Knowing full well that free things are held in contempt, I require a small payment for my stellar services -- usually a foot massage or hair cut or some other piddly thing. I'm glad to help them toil for necessities, for commodities, for income-producing materials they can sell on Craig's List. And the work is good for me lest I grow old and flabby. I don't pretend that manual labor is easy. But I do believe, strongly believe, that living a simple life-style gives you a perspective on life you can't get otherwise. At the very least I'll have lots of happy memories when I'm old and senile and sitting on my front porch watching the grass grow and the fish jumpin' in the pond. 6:32 AM A heads-up to the residents in our area. We've been told that several rabid skunks were found recently in Granville County, NC (just to our south). So be aware accordingly. A skunk with rabies will attack anything, even a human. We're keeping a close eye on our dogs and herds. 7:37 PM Today in history. Even though I was only 7 years old at the time, I recall this day vividly. People don't realize that I was born in a territory of the United States, not a state. Of course, a case be made that the acquisition of Hawaii in 1898 was illegal. A strong case. However, in my opinion there is practically no chance Hawaii could ever secede from the Union, as the Hawaiian independence movement seeks. 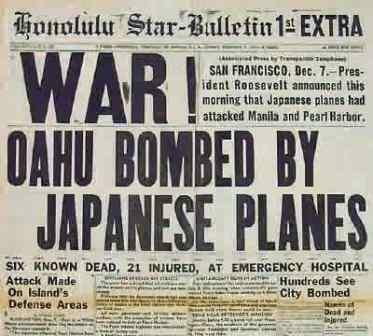 Hawaii is, however, a good reminder that "regime change" in American foreign policy is nothing new. By the way, the two most collectable front pages of the Honolulu Star-Bulletin are unforgettable. 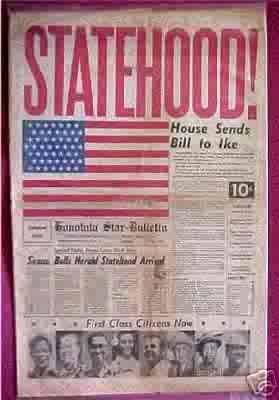 One says "Statehood!" The other, "War!" I've got a copy of the former laying around here somewhere. Paul’s speeches and Internet essays appealed to millions of principled conservatives who rightly feared the power of unrestrained government. Most rank-and-file Republicans either cannot or do not think in such terms. Indeed, few of the important issues raised by Congressman Paul were challenged by the mainstream media, whose reporters, one can perhaps argue, all too often served as the administration’s voice box. 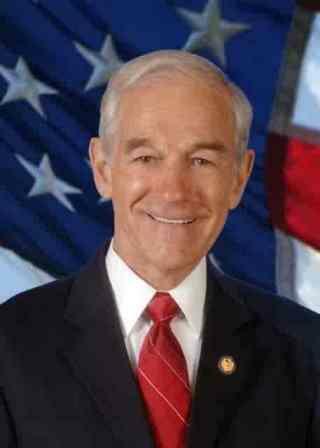 As a committed paleoconservative, Ron Paul knew he had to question the doctrine of the preemptive first strike; he knew he had to insist upon a Congressional declaration of war should hostility be unavoidable; he knew that promises of quick and easy victories were hollow; he knew the tendencies of human governments to become power-hungry. No one will be surprised that Ron Paul was subjected to contemptuous belittlement and ad hominem attacks during the 2007-2008 presidential race. Americans do not like to be told that a sitting president of the United States can lie the American people into war. Of course, this is exactly how the nation got entangled in Vietnam after Congress passed the now-infamous Gulf of Tonkin Resolution. Throughout it all, Ron Paul, a proud veteran of the United States military, made it clear that he was acting as a fervent patriot who loves his country. Like a broken record, his message time and again was on track: the United States has a Constitution, which says we will abide by the rule of law. If democracy requires a broad public discussion of the issues at hand, America should be grateful to Congressman Paul for producing a good deal of healthy “agitation” via the Internet. When a sitting president of the United States dismissively says, “I believe what I believe is right,” as George W. Bush did to a group of journalists in Rome in the summer of 2001, perhaps one can be justified in giving thanks for a Texas Congressman who has helped millions of citizens question America’s anti-republican tendencies. In the best tradition of the nation’s Founders, Ron Paul believes that the GOP’s militant foreign policy is a betrayal of the Jeffersonian ideal of “peace, commerce, and honest friendship with all nations.” Why, he asks, would Americans want to replace that ideal with a Manichaean “You’re either with us or against us”? A very good question, if you ask this writer. 1) Becky took Sheba for a bath and grooming this morning. Sheba's fur is as smooth as silk. We're told, however, that when she has weaned her last puppy she'll lose most of her beautiful hair! 2) Becky's quilt is making good progress. It highlight's her mom's favorite hymns. Ain't it sweet? 3) I'm typing away on my essay on Ron Paul and the 2007-2008 campaign. Half way done! 8:28 AM Update: 76,000 people in Ethiopia need emergency food aid. 8:25 AM Check out this table of per capita income. (To shorten things, I've skipped from #8 to #201.) It's one reason Becky and I work in Ethiopia (which is the poorest nation on earth according to the Atlas method). Source: Per Capita Income Around the World. 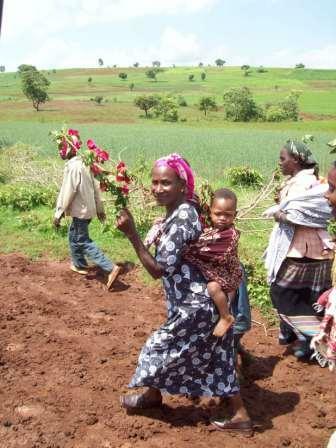 Below: Women, the work horses of Ethiopian society. I've never seen anyone work harder or complain less. Yes, I include my African-American wife in this description. I love the people of Ethiopia. Even the poorest peasant woman has a dignity about her that is unforgettable when you see it. These dear ladies literally wore their Sunday best because they knew we were coming to their village that day. God bless 'em. 8:15 AM Eric Carpenter tips his hat to the Reformers. And well he ought to. But I could wish Luther and Calvin had gone further in their reforms. A lot further. Here's a great quote from Henry Vedder in his book The Reformation in Germany (New York: Macmillan, 1914), p. 345. Give it some careful thought. Though what he says is perhaps debatable to some, I think he is absolutely right. [The Anabaptists] were the only party among those protesting against the errors of Rome who were logical and thoroughgoing. They alone accepted in absolute faith and followed to its necessary consequences the principle avowed by the leading reformers, that the Scriptures were the sole source of religious authority…. The Anabaptists alone had penetrated beneath the surface of traditional Christianity and comprehended the real Gospels of Jesus…. In a word, the Anabaptists were the real reformers, and the only real reformers, of the Sixteenth century. You will notice that picture-loving me has posted no photo of any Anabaptist leader/theologian. That's because you can't identify Anabaptism with any single intellectual. It was, and still is, a grass-roots movement. The pomp and display, the ambition and the pride of Christendom, seen in both their Roman Catholic and Protestant forms, were the precise opposite of the submissive humility that characterized Anabaptism, even among its leadership. 5:30 PM I grew up with more salt water than blood in my veins. Which is one reason I enjoyed Alan Knox's latest post called The Church at the Beach. In the mid-60s, the Jesus Movement was in full tilt, and so was this surfer dude. In Hawaii I surfed, on average, 365 days a year. Sunday's included. Wanna see where I attended "church" on Sunday mornings at 10:00? The Hilton Hawaiian Village Hotel was the perfect venue for a surfer's "paddle-in" church. After the one-hour service was over we'd paddle right back out. On a really good day, here's what the surf looked like. I can still taste the salt water and feel the spray as the tube spits you out. Sure, it was a "para-church" thing, with no real commitments or relationships, but I didn't know any difference at the time. I just knew that somebody out there loved us non-conformist types, loved us enough to provide some good Bible teaching, and then loved us enough to send us right back into the churches we came out of, after we had grown up a bit. For me, that was about 16 years of age. And I've never looked back. Jesus put His eggs in one basket, folks, and that's the local church, a place with a big heart, a place big enough even for long-haired, mariachi sandal-wearing surfers. 4:45 PM My new book will have an appendix called "Website Resources." If you have a website you think should be included, let me know. You can probably tell whether a site is simpatico by checking the book's table of contents here. Even if you're the site's author, don't be too shy to send it along. 4:37 PM Henry Neufeld asks some very good questions about Georgia and Ossetia. 12:37 PM What is your post, friend? We all have one. On Dec. 7, 1941, Kermit Tyler had his. Fifty-two minutes before the attack on Pearl Harbor began, two army privates, manning their radar station on the northernmost point of Oahu, plotted a fight of aircraft flying toward Oahu from the north. They reported to their supervisor, Lt. Tyler, at Fort Shafter in Honolulu what they had seen -- direction, mileage, and apparent size of whatever it was. One of the privates called the blips "the biggest sightings he had ever seen." 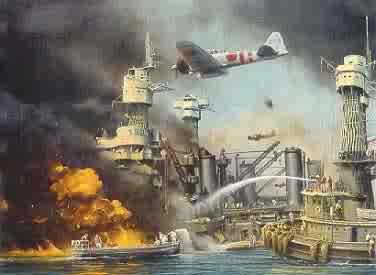 Lt. Tyler took their report and, in a scene immortalized in the movie Tora! Tora! Tora! said, "Well, don't worry about it." Tragically, his assumption that the planes were B-17s flying in from the mainland was wrong, and within an hour the U.S. fleet began to be assaulted by 350 Japanese aircraft as it slumbered on a quiet, Sunday morning. We too have a post. What's yours? I often wonder what mine is -- or should be. I'd like to think it's what Paul described the function of a prophet to be in 1 Cor. 14:3: "The one who prophesies speaks to the people for their edification, their encouragement, and their consolation." I hope and pray, in everything I do, whether it's through my website and blog, in the classroom, on the foreign mission field, in my own home and community -- I hope and pray that through me others are (1) edified, (2) encouraged, and (3) consoled. So it is with the church. 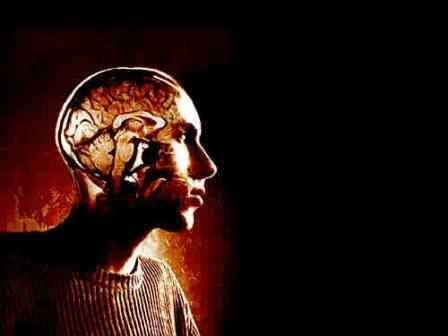 It is absolutely essential they we do everything in a way that honors our Head. And it is His command that we love one another, be committed to one another, affirm one another, AND ALSO bring into the fold hurting, needy worldlings regardless of their race, skin color, or social status. Let me say it once more, strongly: It is not enough to love the Lord and each other. It is only enough when we love the Lord, one another, AND His world too. All three priorities are to be the most fundamental part of our lives, all the time. Can I get a witness? 12:17 PM Sound the trumpet in Zion! I just put away in our basement the last of our canned vegetables and canning supplies -- tucked them in snugly until next summer and kissed them all nighty-night. Ain't it strange -- you can't wait for your summer veggies to come in, and then you can't wait for it all to be over with. Thanks to Jesus, we had a bumper crop this year. By growing our own vegetables and raising our own meat, we are able to save money that can go for more important things than groceries. Still, it will seem strange not hearing the pressure cookers running off their mouths on the stove top! 7:39 AM Here's a powerful essay by Claire Meckler. Claire is a nurse who works with SIM in Ethiopia. 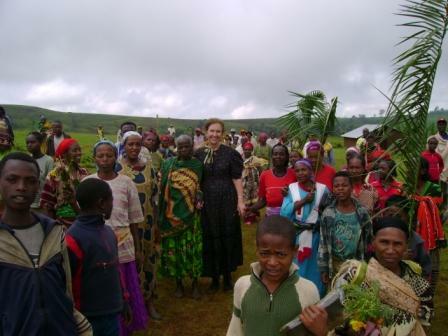 Becky and I met her in 2004 after she had just returned to Addis Ababa from the field. Her essay is called "But Why?" Today the two-year-old child died. Because he was severely dehydrated. Because he drank dirty water. Because his ten-year-old sister was too weak to fetch clean water from the distant spring. Because she's extremely anemic...because of intestinal parasites.. because of unsanitary conditions. So why didn't the older brother go and get clean water for the family? Because he didn't know the nearby muddy water harbored disease. And why didn't he know? So fragile is the coping mechanism of struggling people that whole communities are vulnerable to events like variations in climate or deteriorating health status of family members.... There is Someone who can save them from an endless cycle of "whys" -- a God who cares deeply about their suffering. Many years ago this statement deeply impacted my life: "A God who cares cannot be served by those who don't." May we all learn to care as he does. Our Galana clinic in southern Ethiopia is designed to provide basic health care services. It provides simple emergency care (wound treatment, IV therapy). It provides labor and delivery (for uncomplicated births). It provides well-baby and pre-natal monitoring (immunizations, education). It provides health education (AID/HIV, child and baby care, prenatal health, sanitation, diseases). Mostly it provides the love of Jesus. Every second the clinic doors are open our fulltime evangelist will be ministering to the hearts and souls of precious people. All clinic personnel are loving, caring Jesus-followers. Becky and I are committed to doing everything in our power to see that the clinic is fully operational this fall. In November we are taking with us a pharmacist, a PA, and a nurse. We are taking someone to install solar panels for electricity to power the refrigeration for the meds. We are taking pastor-teachers who will feed the souls of the workers and share the Gospel in word and deed with the lost. Basic hygiene will be taught. Basic principles of agriculture will be taught. Seed will be distributed. Bibles will be handed out to those who have earned them. The Scriptures will be taught to men, women, and children. "All this is from God... who has given to us the ministry of reconciliation." I believe that, thus far, everything has been given to us by God in direct response to prayer. Shortly I will be posting a prayer guide. I hope you will consider copying it and referring to it in your daily prayer time. Many of you are already praying for this work, for our team, and for Ethiopia. It's strange, but once Jesus puts a nation on your heart, you can never get it out. 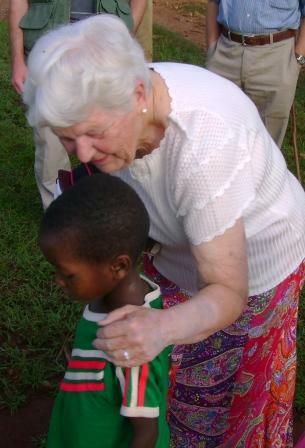 Below: Becky with the infant boy she delivered on our 2004 trip. He was born on a Sunday. They named him, "Born-on-Sunday." 7:24 AM Greek students, check this out! 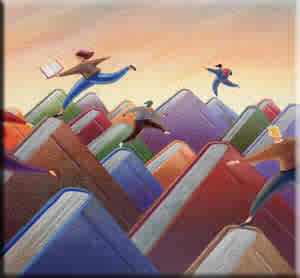 7:16 AM The latest addition to our home page is called On the Writing (and Reading) of Books. 7:24 PM Today someone told me about a street preacher who had been roughed up by a group of thugs on a beach in Virginia and then arrested for disturbing the peace. It got me thinking about "methods" of evangelism. Personally, I do not pass out tracts, put bumper stickers on my car, or do street preaching. In short, I don't go for such methods of evangelism. But God can still use them. Someone once said to Dwight Moody, "I don't like your method of evangelism." "What's yours? ", asked Moody. "I don't have any," was the answer. Said Moody, "I like mine better than yours." Cynicism over methods can be healthy or unhealthy. It's healthy only if you yourself move out in faith to the needy and lost around you. Amen? 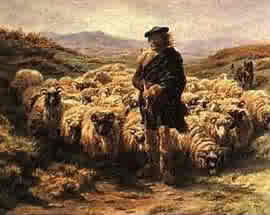 Below: Moody preaching in London. 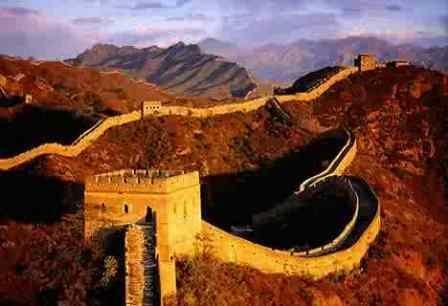 12:36 PM The Miami Herald is reporting that Dwayne Wade was booed at Beijing's Great Wall for cutting in line. He's probably not looking for unsolicited advice, but I'll offer it anyway. 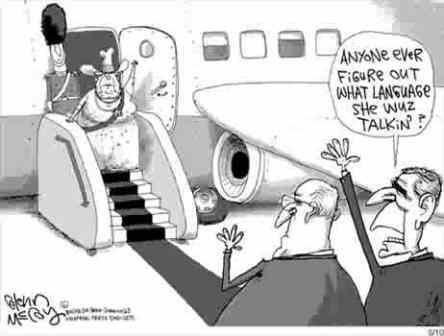 Man, you're a guest in that country, not a VIP. Cutting in line is a no-no for tourists. You want to play the bully boy? Do it at home. You want to find a casus belli, act like an ugly American. Naturellement, the Chinese (and other tourists) are gonna be both jealous and contemptuous of you when you look down your nose at them. We Americans can become so blinded by our own bloviation that we fail to see how foreigners look up to us (notice the curious looks I'm getting in this photo). We don't need dunderheads encouraging any more stereotypes of America abroad or at home. 11:38 AM I really enjoyed Brother Rafael's post about ethnic diversity on our campuses (or, really, the lack thereof). If you're an ethic minority, I know how you feel. 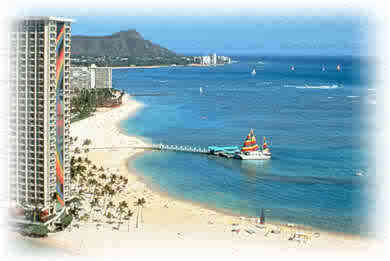 I grew up as one in Hawaii. Believe me, it's no "melting pot of the Pacific." I got shoved around pretty good by the locals, beat up once or twice. That said, there was nothing better for a Jesus-follower than growing up in the midst of numerous races and nationalities: Chinese, Korean, Japanese, Filipino, Hawaiian, Portuguese. My dream of a more diverse Church (in all its related institutions) jives with the politically correct emphasis on diversity, but it is not motivated by political correctness. Rather, I have in view the vision of John the Elder, who was granted a glimpse into heaven and was surprised by the gathering from every nation, tribe, and tongue to worship the Creator of the universe. Making our colleges and universities more accurately reflect the racial make-up of the country (or even the world) isn't a bad idea; a better one is to bring our institutions into conformity with the racial make-up of heaven. By the way, Rafael, congrats on your wedding anniversary. Many, many more! 10:37 AM Becky has written the following update on our Burji mission. 1. Seeds to distribute in villages after Leigh’s farming workshop. Also, seeds to distribute to Gujis as part of a Reconciliation Conference. The drought of this year has not only caused the loss of food, but also the loss of seed. By teaching about farming productivity and by distributing seeds, we are helping much in the area of family nutrition and economic stability. We’ve purchased the seed (field peas, kale, Crowder peas, turnips, etc.) because seed is fast becoming unavailable. We purchased these on credit. Some gifts have been received toward this cost already; the remaining need is $285. 2. Food for widows and orphans as part of Reconciliation Conference. We are dealing with about 10 widows who have been put in this condition by the warring of the Gujis upon the Burjis. Scripture commands us to care for the widows in the world, as evidence of God’s care for the down-trodden. It is an outward demonstration of His stooping to us in our poverty and need. The Guji churches are collecting an offering for the food for these widows as a way of making restitution for the sins of their tribe. We want to supplement that offering, so that we can offer more substantial help, and also to demonstrate the unity of the Body in dealing with spiritual issues. If we give $100/widow, this will buy a large sack of tef grain and some vegetables. So the total needed is about $1000. 6. Wash basins and soap for the village homes after Lynette’s hygiene workshop. There is very little hand washing in the typical rural Ethiopian home. This leads to serious health problems. 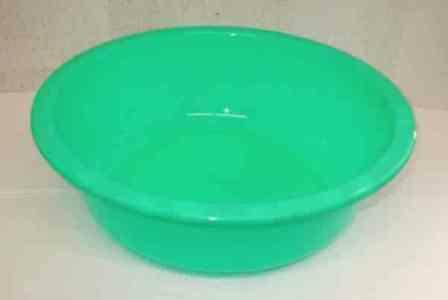 Lynette is teaching women and children about hand washing, and we want to give a wash basin and a bar of soap to each household that attends and passes a “quiz” on the material of the workshop. The price is $2/household; we are guessing 150 households/village X 4 villages, for a total of $1,200. 8. Cloth pictorial timeline for the evangelists and rural churches. The IMB has a story cloth that tells the story of God’s working from Creation to Christ’s ascension. This cloth folds up and is easily carried to villages in the back pocket of an evangelist. Or it can be hung on the wall of a rural church and used for teaching. 45 cloths cost $485. You may send your gifts, payable to BeckyLynn Black, to Bradford Hall, 2691 White House Road, Nelson, VA, 24580. And remember: every penny goes to Ethiopia. We are fully self-supporting missionaries. For a printable copy of this list, please click here. 7:58 AM Last night we held our second in-depth training session for our Burji Team, comprised of Jesus-followers from the Roxboro, NC, area. When I say "in-depth" I mean it. Becky and I arrived at Ca-Vel Baptist Church at 6:30 and left at 10:20. To glorify God and extend His kingdom is our one goal. God has given us permission to commit all of our little concerns (and big ones, too!) into His hands, and we took advantage of that permission last night as we bathed the work in prayer. We began with a group discussion of our theme book, 2 Corinthians, and then Becky walked us through a detailed list of objectives for the evening, including getting our passports in order, applying for our visas, making our flight reservations, knowing how to dress in-country, and especially discussing everyone's personalized ministries. I wish you could have been there! The spirit of cooperation in the Gospel was amazing. For several of our team members, this will be the first time they've traveled to the Third World, and a team of health care workers was on hand to administer immunizations. Then we went through the long list of personalized ministries, brainstorming how we can best use our God-given abilities to serve the Ethiopian church. We carefully coordinate these ministries with the elders of the churches in Burji with which we work. Everything we do is done either at their behest or else with their enthusiastic approval. This spirit of cooperation is one of the most rewarding aspects of working in Burji. 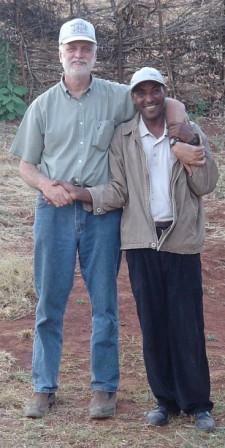 I simply shudder when I think of how many American missionaries work independently of the local churches in Ethiopia! establishing solar power at the clinic, lights in the clinic, the chaplain's loudspeaker, outside security lights, etc. Finally, pastor Jon helped us to coordinate community prayer meetings in Roxboro for people from various churches to meet together to intercede for Ethiopia both before and after our trip. In case you're interested in participating, I'll list those dates and venues for you in a subsequent blog post. As we saw in our group study of 2 Corinthians, we are not sufficient in our ability for these things, but our sufficiency is from God. Jesus in His love and power has supplied us with everything we need to serve Him. In the same unchanging love and power, He will provide whatever we need in the future. Now, in case you're asking, "How can I become involved? ", stay tuned! 11:51 AM In this blog I've often said I don't consider myself a "scholar." (See 2 Cor. 10:12!) Now I have expert confirmation that what I've said is true. The authors of this textbook on Paul write that "Hebrews remained within the Pauline canon until the Reformation, when Erasmus, Calvin and Luther questioned its status as a letter of Paul. No modern scholar accepts it as Pauline" (p. 290). So there you have it. Since I hold to Pauline authorship, I am no scholar. LOL! 8:38 AM Today I'm requesting prayer for the couple pictured below. Acts 4:1 says, "While they were speaking to the people...." That's all the apostles had to do to get into trouble. That's all they had to do to get arrested and imprisoned by the civil authorities. Just share the love of Jesus with others. But God sent an angel and released them! And why did God do this? So that they could go back again and "tell the people the message of the new life" (Acts 5:20)! Radical disciples of Jesus embrace those on the other side of the dividing walls of hostility in our world, even including our "enemies." 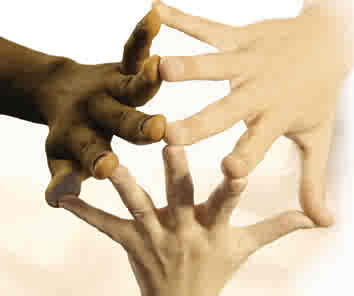 Christianity transcends all boundaries – cultural, racial, political, geographical, natural, even national. Do you really believe that? If so, while you are praying for this precious couple in Jesus as well as for their persecutors, it might also be a good time for you to remove those idolatrous American flags from your sanctuaries and get real about the Body of Christ. Friends, Jesus is not an American. He's not a Democrat or a Republican. He's a foot washer. Are you? Am I? 7:27 AM The latest addition to our home page is called About Those Sunday School Quarterlies. 7:42 PM Nate and Jess just paid us a visit. Sheba is always happy to see her former master. Here Jessie holds one of Sheba and Sheppie's pups. They've just started opening their eyes and walking. This was neat. Sheppie meets his son for the first time. With a litter of 5 and only one male, this is his "only-begotten son," as Jessie reminded us. 4:38 PM Was Jesus a carpenter, brick mason, house builder, or what? That's the topic of David Ker's recent post at the Better Bibles Blog. 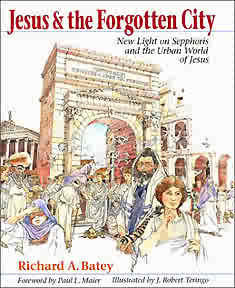 Before you decide, be sure to check out Richard Batey's Jesus and the Forgotten City -- the city, of course, being Sepphoris, Herod Antipas' capital in Galilee and just a short walk from Nazareth. Batey argues that Jesus and his father and brothers worked as builders, had, in fact, a fairly lucrative construction company, as it were. And they went to work where the work was (we know that Herod loved to build). The point? Jesus may well have come from the same class of society that most of us come from -- the middle or upper class. Which means that He left a lot more than just His family behind when He went out and received baptism at the hands of John the Baptizer. Who Is Head of Your Church? So then, from now on we don't think of anyone from a merely human point of view. If we did think of Christ from a merely human point of view, we don't anymore. Whoever is in Christ is a new creation. The old way of living has disappeared. In fact, a brand new way of living has come into existence! God has done all of this by restoring our relationship with Him through Christ, and He has entrusted to us this ministry of restoring relationships. In other words, in Christ God was restoring His relationship with humanity. He didn't hold people's sins against them, and He has entrusted to us this message of restoring relationships. Therefore, we are Christ's representatives, and through us God is appealing to you. We beg you on Christ's behalf, "Be reconciled to God!" God had Christ, who never sinned, take our sin so that we might receive God's righteousness through Him. God's peace granted to us! We are pardoned and accepted! God has changed our relationship with Him from hostility to friendship, from wrath to love, from condemnation to justification! Forgiveness and acceptance -- all flowing from the blood of Christ! Bearing shame and scoffing rude/In my place condemned He stood;/Sealed my pardon with His blood:/Hallelujah! What a Savior! 5:42 PM Here's a crazy thought that occurred to me today clear out of the blue: Even though I'm on sabbatical, I'm still teaching. The cult of the classroom is an interesting phenomenon. New Testament ethics is to be sweated out in the daily interaction of the Gospel and life, not simply talked about in the sterile atmosphere of the ivory tower. I think we educators place an undue emphasis on the cognitive. My hunch is that Jesus knew this. His method of instruction was mediated through relationships, as Miss Mary illustrated to us in Soyama last year. This is why I much prefer, say, being involved in a Sunday School class to sitting in a lecture hall. We learn how to live like Jesus by living out Christ's life -- His weakness and power -- alongside our fellow believers. It is my conclusion that the lecture method is no longer viable if we depend on it to shape our dominant ethos as Jesus-followers. I am also unconvinced by those who claim that the Internet has now freed us from real life relationships to the extent that we can throw off our dependence on practical, hands-on training. Learning a craft like discipleship requires absorbing nuances that simply can't be taught formally. This is why all genuine forms of leadership require training in servanthood. We must remember that the Gospel does not require education but it does require faithfulness. Which is one reason I'm very excited that 3 servant-pastors will be coming with us to Ethiopia this fall (one of them, Jason Evans, is shown below on his trip with us last year). It will be the rubber meeting the road or, as we used to say in California, the chili meeting the cheese. I can't wait to get started. Ron Paul attempted to do what few thought was possible for a Republican politician: stand up and contradict the falsehoods and mistakes of the Bush administration. Paul sought to use the Internet to reach out to those Americans whose heads were being filled night and day with Fox News Channel, MSNBC, Sean Hannity, or Bill O'Reilly. He sought to use the Information Age to provide the public with countless facts and solid arguments so that Americans could make reliable decisions for themselves. He argued that if a nation could tell the difference between truth and falsehood it would not fall prey to the groupthink and propaganda of the political elite. By challenging the rightist fiction of his fellow Republicans, Paul brought new clarity to the important issues of the election and a renewed awareness of how easily Americans may be misinformed by their own government and uninformed by their own press. I still have to type the essay -- that's the part I thoroughly dislike! 1) The Guji-Burji situation has settled down considerably, thank the Almighty. 2) The civil leadership in Soyama (the "county" seat in Burji) recently visited the Galana clinic site (photo below) and is very supportive of what we are doing there. Meanwhile, I would ask for special prayer for Becky as she continues to oversee the details of the clinic work as well as organize the team of Americans we are taking with us this November. She spent the whole day on the computer awash in a mass of tedious but important minutiae. Organization is God's gift to her, and she excels in it. 8:11 AM I see I'm not the only one who loves the Anabaptists. Well said! 7:00 AM Greek students! Rafael Rodríguez writes to tell me about his new website called Greek Bible. Check it out. 6:35 AM Yesterday Liz and the boys, along with her sister and her 3 children, stopped by for a visit. We had a blast. No TV, no toys. Just old-fashioned farm fun. Here are some pix. 9:26 AM Chuck Baldwin identifies America's Greatest Threat. 8:50 AM The latest addition to our home page is called Is America Sounding Jeffersonian Again? 8:37 AM Saw Hitchcock's North by Northwest for the umpteenth time last night. There's even a blog devoted to the movie. 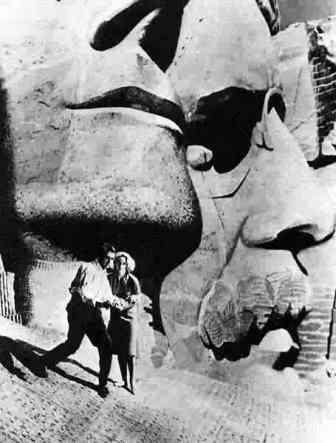 I love the finale where Cary Grant hides in Lincoln's nose on Mount Rushmore only to be flushed out by a sneeze. Just kidding. The whole scene was filmed on an MGM lot, but you could have fooled me. My favorite part of the movie? The music. It's perfect for the film and actually fits the scenes, unlike those modern movie soundtracks that provide only background noise. By the way, did you notice the boy who plugs his ears when Eve Kendall "shoots" Roger Thornhill? Look for it next time. Neat blooper. 8:31 PM Greetings, friends. Our pooter is up and running again, Gott sei Dank. And thanks also to Alan Knox and Caxton Mburu for their help. You guys are geniuses. And always willing to help. What examples of the Jesus way of life! Since I had to take the tower to campus today I was treated to visits from numerous students who heard I was on campus. Thanks for stopping by, ladies and gentlemen. It was great to hear about your plans for the new semester. I share your excitement. I pray that this school year will not only meet but exceed your expectations, and that you will bring Jesus great joy in all you do. When I got home Becky had deep-cleaned the entire house. It looks fantastic. We were both too tired to cook so we went to the local Chinese buffet in the "big" city of Clarkesville here on Kerr Lake. Funny, we live so close to the water yet I have absolutely no interest in aquatic sports any more. The farm keeps me busy enough -- and it's a good, healthy, outdoor form of re-creation too. Tonight we're relaxing. Tomorrow we've got farm visitors. Saturday I think we'll finally make it to Carolina to get the tin. Right now I've got several lectures to prepare for my sabbatical travels. Two of them have to be in publishable form before I leave in September. And Becky is furiously busy with preparations for our trip to Ethiopia in November. There's so much work to be done before we even get there. My heart these days is especially fixed on the poor. The poor have always been a concern of the mission of the church. I see this not only in the Radical Reformation but also in the witness of Barth and Bonhoeffer during the time of the Third Reich. In the Third World where Becky and I work this issue is far from academic. We are motivated by the concern shown in the New Testament for the poor, widows, orphans, and those who are marginalized in society. I believe the church has to maintain a stubborn hope for something more than what any existing socio-political order has been able to provide. That's why I can't get too excited about the "positive" posturing of the Obama and McCain camps. It is love -- and only love -- that ultimately declares politics to be wrong. We do in love what politics can never do -- cast down what has become old and breach the wall of complacent inaction. The church of the New Testament was in constant revolution. It was more radical in extent than what the most zealous political movement could ever offer. Even the secular government in Ethiopia is realizing that politics has a less decisive role to play than the church in healing the curse of tribal warfare. With this in mind, I'm looking forward to reading a book I received from Amazon in today's mail. Stanley Hauerwas and I are hardly on the same page theologically, but his A Community of Character: Toward a Constructive Christian Social Ethic takes up a theme that is near to my own ethos: the church's responsibility to be a witness to a world that neither knows nor lives the ethics of Jesus. I spent a good deal of time in my new book on this subject and will not bore you with the details here. Suffice it to say that it will take more than talk to help the poor in Ethiopia. We need boots on the ground. We need people who confess "guilty" to scandalous love. We need true Gospelers. I’m fortunate enough to be typing this in my farmhouse in Virginia, surrounded by dense summer foliage and beautifully fragrant flowers. But it's nothing compared to what God has promised me in the next world. In the meantime, I try not to forget that God didn't bless me with all this so that I could just sit around and watch flowers. Where much is given, much is required, and my blessings have only made me more aware of the millions of people who do not enjoy the blessings I have. I'm not exactly the committed Christ-follower that I want to be, but I do believe I've begun traveling the downward path of Jesus. 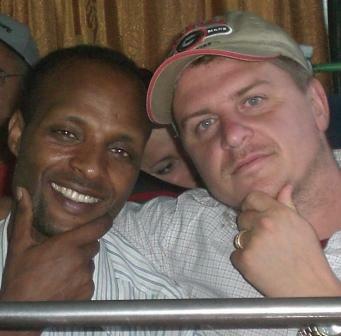 Below: Two of my beloved Ethiopian sons, in whom I am well pleased. Worku (left) and Burje insisted on going with me when I visited the Gujis last June. 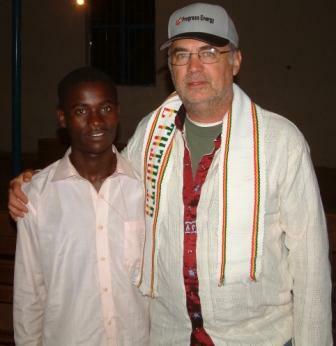 Burje's father was killed by the Gujis 15 years ago while sharing Jesus with them. This summer the believers among both tribes have asked me to speak at a repentance/reconciliation conference to be held on Guji soil. I can't wait. 7:06 PM We've experienced technical difficulties with our computer all day. The main problem now is that we can't access our email. If you're awaiting a response, hang in there. I'm a total klutz with pooters, but I'm getting lots of help! The centerpiece of the room is, of course, the fireplace and mantle. Their next step is to paint and put up the wall paper. They're having a blast working on this family project together. Jessie's venison tonight was delicious, as was her homemade coffee cake. Nate and I are blessed beyond belief to have the two best chefs in all of Southside Virginia. Becky's almost done with her quilt squares. Et moi? 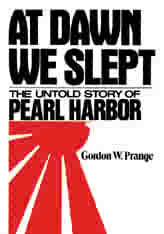 I'm back to my Pearl Harbor book. Tomorrow it's down to Carolina to get some tin off the roof of an old house. Good thing, too -- will help me work off some of the calories I've been putting on with all this good eatin'. 6:53 PM We got some wonderful news today. Becky was finally able to get through to our son David in Alaba this morning. David reported that Baby Nathan has been healed of malaria! I am so relieved to hear that. Thank you, thank you, thank you for praying! Meanwhile we'll try to get through to Burji for an update on the warfare there. On another note, it was a joy for me to be back on campus today. I saw many of my old pupils, joked around with my colleagues, advised the new Advanced Biblical Studies students, and especially welcomed Paul Himes and Michael Stover who just relocated to Wake Forest to take up their Ph.D. and Th.M studies respectively. Below are their mug shots. Right now it's off to N. and J. 's for supper -- with great rejoicing in our hearts because of God's goodness to us for having spared our precious Baby Nathan's life. 5:59 AM Students, in a few minutes I'll be driving to campus. Today I've got appointments at 9:00, 10:00, 11:00, 1:30, and 2:00. Otherwise, my door is open and you're most welcome to come on in. 5:52 AM Last night we had Nate and Jess over for dinner. Yours truly cooked. (Guess what he prepared?) Tonight they've invited us over to their farmhouse for dinner. Jess is cooking a roast. They've made lots of progress on their parlor. I may even post some pix for ya'll to enjoy. They are a neat couple. Glad they're so close by. Incidentally, Jessie recently updated her blog. Go here to read it. 4:34 PM Still no news from Ethiopia about Baby Nathan or about the Burji-Guji war. Please continue to pray. a focus on God's love for all people, including our "enemies"
These are, of course, all somewhat "radical" positions, but I've never been one to anoint the status quo with holy oil. It's probably not a coincidence that my two major hobbies in life have been big-wave surfing and cross-country riding (on my Thoroughbred Traveler). After all my years of studying and teaching I'm still somewhat of a risk-taker. I give thanks to God for allowing me to write books and articles on the synoptic problem and textual criticism and the authorship of Hebrews -- taking "unpopular" stands along the way, not because these views are not widely held but because I saw the evidence as backing them up. But truth is a complex matter. I shudder to think how blind I still am. Still, I'm hoping to do what I can to hasten the demise of Christendom (not Christianity! ), if not in the U.S. then at least in my own heart. During my sabbatical this fall I look forward to learning more about what it means to be a Jesus-follower, mostly by doing it rather than by writing about it. 8:42 PM Good evening, bloggers and bloggerettes. We're back from visiting with Kevin and Pam Brown and our good friends at Mount Pleasant BC. We stayed in the Brown's beautiful home in the foothills of the Blue Ridge, just before you ascend to Boone. The scenery was gorgeous. Pam made a point of feeding us like royalty. The 4 teaching sessions went very well. I especially enjoyed seeing how the youth have been integrated into the congregation (Mount Pleasant no longer has a "youth group") and how the congregation is moving toward a radically biblical approach to ministry (you know, "every-member" ministry). Becky also had a chance to share about our upcoming trip to Ethiopia in November. Mount Pleasant has already been greatly used of God to assist our evangelists in northern Ethiopia, for which we are very grateful. All in all, a wonderful weekend. My thanks to all those who welcomed us, hosted us, fed us, and made us feel right at home. You're never a stranger in the Body of Christ. Tomorrow I'll spend rewriting my manuscript -- ruthlessly pruning unnecessary adverbs and adjectives, shortening sentences, removing exclamation points, and tightening up the style. On Tuesday I'll be on campus to welcome my new Ph.D. and Th.M. students and pow-wow with the administration about our new masters degree in translation and linguistics, which we hope to begin next fall. Tonight I'm chilling out with Gordon Prange's At Dawn We Slept -- a book that reminds us that even the most hardworking, diligent, and intelligent human beings are capable of making enormous blunders. 12:26 PM A shout out to all of my graduate students who are beginning to study their "research" languages. You are entering a strange new world. Its roots and trunk are Greek and Latin; its branches are French, German, and Spanish (I include the latter because of the work being done today by Spanish New Testament scholars). I also know a smattering of Dutch, Italian, and Portuguese, but these are not my specialties. I have all but ignored the Slavic languages (to my regret). Of all these tongues (other than Greek) I imagine the most important are Latin and German. In Germany the end of the Middle Ages coincided with the end of Latin and the appearance of Luther's German. The English that we speak today is a Latinized, Gallicized German. In these languages I have had no formal course work (except in Greek). It seems to me that once you know Greek, the other languages are fairly easy. That is certainly true of German -- though not the Swiss German that is spoken in the city of my alma mater, Basel. The Swiss clearly prefer their dialect to Hochdeutsch. In Switzerland, Germany is sometimes referred to as "the Great Canton," as if it were merely another canton of Switzerland. Now, I've written a short piece about how one should go about learning modern languages. If you are just starting out, you might want to take a look at it. It's called How to Master a Foreign Language. If you can, try to learn how to speak the language, not just read it. Of course, speaking is much more difficult than reading, and you will make many mistakes along the way. As an illustration, let me share with you a story I once read about an interrogation that took place during World War II between an American officer (a captain) and a captured German soldier. The captain asked the POW, "How do you get along with your commanding officer?" "Splendid," replied the prisoner, adding, "Why, just last week he said to me, 'Du bist eine Kanone.'" (Kanone is a German idiom meaning "great guy.") The American, whose German was hardly fluent, misunderstood him and shouted, "Cannon? Cannon! Where is the cannon?" Smiling, the German replied, "Ich bin eine Kanone." "Du bist eine Kanone?" said the American. "Er ist eine Kanone!" added the German, pointing over his shoulder to his imaginary commanding officer. Thus, the German added, "Wir sind Kanonen!" "Ihr seid Kanonen?" blurted the interrogator. "Sie sind Kanonen," concluded the POW, adding, "We have just conjugated the verb 'to be."" Here is prayer request for you about BurjI and Guji. For the last two days there was war between Burji and Guji because of that three people died and about five people injured seriously two of them taken to Arba minch Hospital. For time being the road that comes from Hagere mariam is closed. We are praying earnestly for Gods peace as you have been doing previously let you share our burden with us and pray for the people. You'll recall that I spent a week visiting the Burjis and Gujis last June. This November I have been asked by the churches to trek to the Gujis with the hope of holding a peace and reconciliation conference with the two tribes. I'll provide more details about that conference later, but for now let's pray for the cessation of hostilities and the healing of the wounded. 7:45 AM America's fastest dying cities. They're also mission fields for radical Jesus-followers who are willing to get their hands dirty. 6:50 AM Steve Weaver has posted three very helpful studies (.pdf) of the central section of Paul's letter to the Philippians. Check them out when you have a moment. 6:43 AM This day in history: Lee offers his resignation after the defeat at Gettysburg. 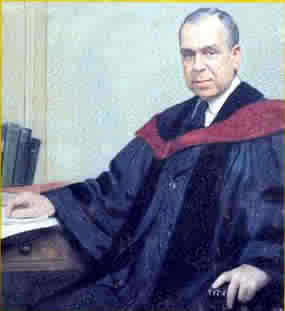 Two years later, he would become the president of Washington College and, according to Flood's Lee, the Last Years, go on to find great fulfillment in the field of education. Lee did everything he could to heal the wounds left by the war. In my book, that deserves a lot of credit. 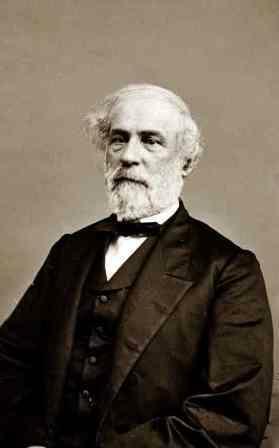 Below is a picture of an aged Lee taken during his presidency. One of the things I appreciate about Lee is that he had a chapel built at the college. He never required attendance either, arguing that you do not force people to worship God. If you've ever been to Lexington you've seen the pew in which he sat during chapel services. Lee led by example; his students followed him in peace as in war. 6:39 AM For any of you using my my Learn to Read New Testament Greek this semester, just a reminder that online flashcards are available here. Also, the Academy of Ancient Languages has provided vocabulary cards, translation exercises, and other helps for your use. Enjoy your Greek studies! 6:30 AM Good morning! What a beautiful day for a drive. Today Becky and I leave for our Bible conference at Mount Pleasant Baptist Church in North Wilkesboro, NC. Last time I spoke there we experienced snow flurries! Tonight I'm speaking on the single most important key to understanding the Bible. Tomorrow night I'm dealing with the Da Vinci Code, the text of the New Testament, and "errors" in the Bible. To illustrate the importance of textual criticism, I've decided to resurrect the variant in Matt. 5:22 and ask, "Did Jesus forbid all anger or only unjustifiable anger?" On Sunday we'll talk about the importance of style and rhetoric in reading the Bible, including New Testament poetry and discourse analysis. Then it's home again home again. This evening Becky and I are having dinner with pastor Kevin Brown and his family. Kevin is the author of Rite of Passage, which describes Mount Pleasant's unique approach to youth ministry. 5:30 PM Here's Becky's latest. Simply beautiful. She's on a roll. It's humbling to think about how much work goes into the publishing of a book, and then to realize that that book is barely a drop in the ocean. When I wrote (and published) my first book in 1984, I had no idea I would ever publish again. My next book saw daylight simply because no one else had written a volume that integrated Greek and linguistics. I clearly recall how unhappy linguists were with it, but students seemed to like the book well enough (today it is still in print in a second edition). As I recall, the greatest objection was that I, as an outsider to the field of linguistics, had no right to produce such a book (true enough). It was also criticized for being too eclectic (I did in fact "pick and choose" from the different linguistic approaches out there, and I have never considered myself a member of any "school" of Greek linguistics). From that point on I determined that with God's help I would try and write at least one book every five years and one major journal article every year. Today, 24 years after publishing my dissertation, I think I'm ahead of the game. I have often wondered, though, what it must be like to be a publisher/editor and receive a manuscript in the mail (or by email). How in the world does one determine whether or not a book should become another drop in the ocean? I'm sure glad to be on this side of the publisher's desk! 2:10 PM Guess what Becky's doing today? Taking a well-deserved break from canning to use her new computerized sewing machine that her mom bought for her. Her current project? A new quilt. Here's how it works. You configure the pattern you want on your laptop. Then the sewing machine does the stitching. And then -- voila! -- your husband takes a picture of the final result. Ain't that simple? This quilt is the first project Becky has done on her new machine. She's making it for her mother. Each square will have the name of one of her mom's favorite hymns on it. This is a BIG secret. Now don't you be tellin' no one, y'hear! 12:52 PM We've been expecting word from Ethiopia about Baby Nathan. So far, no news. If we don't hear anything by tomorrow we'll call. I'll post an update as soon as I hear anything. How I love that child. Meanwhile, amasagenalo betam (thank you very much) for praying. 9:05 AM Brian, I'm really enjoying your discussion of the NLT. I always take a peek at "God's Word" when I'm struggling over the correct translation of a passage, such as Matt. 5:6. Here GW reads, "Blessed are those who hunger and thirst for God's approval. They will be satisfied." Whom does God approve? Those who are right with Him. But those who are right with Him will be committed to doing what is right. I see here both justification and justice. One more thought. The second clause could also be translated "God will satisfy them." We are probably dealing here with a "divine passive." That said, I would retain the passive (rather than performing an active transformation). The reason is this: The passive voice focuses on the grammatical subject. Even the Greek indicates this by using the pronoun autoi for emphasis -- "It is they [and they alone] who will be satisfied [by God]." For me, this means that since I have been made right with God through Christ, I must live out His approval (righteousness) by acting rightly and justly in the world. Or, to move on to verse 7, since I have been shown compassion, I must act compassionately. "By grace ... for good works," as Paul puts it (Eph. 2:8-10). Good works are the fruit but not the root of salvation. Anyway, keep up the good work. Sure is stimulating. 6:56 AM If you don't like okra, go to Greece. I always hated okra -- until Becky and I had some in a restaurant in Athens. It was pan fried in olive oil, if I recall. Scrumptious. I've loved okra ever since. Enough to pick a whole bunch of them in our garden even. 6:50 AM The Scripture Zealot has done us all a huge favor by linking to recent reviews of the New Living Translation Study Bible. Be sure to also check out the publisher's website. 6:42 AM Sheppie's been visiting us while Nate and Jessie are spending a couple of days at her parents' home. So I get to take care of the little guy. The cutie pie follows me everywhere. I'm also doing chicken duty while N and J are gone. What fun! 6:37 AM I love the Internet. Especially when I stumble across such great sites as this one. Chris, your series on the Beatitudes of Jesus made my day. Thank you! 5:45 PM Puppy update. We've got four females and one male. Becky has decided to name them after Ethiopian villages (the ones we work in). The top 10 names are: Keranzo, Bedene, Bassa, Gortancho, Besheno, Mure, Galana, Shule, Chulese, and Kilicho. We'll sell them -- with their Ethiopian names -- when they're about 6 weeks old. Under our system the connection between the cleric and the local Church is reduced to a minimum (p. 63). Even after long years of residence, the people do not feel that he belongs to them. I have heard people complain: "We thought he was here because he loved us, and now he is going away" (p. 64). In South Africa I heard it said that the astonishing revival of the Dutch Reformed Church began when the ministers appointed were nearly all local men, so that their congregations knew them and their fathers and their grandfathers and rallied around them as though they were relations. This is no small advantage (p. 64). Who cannot identify with this, especially if you live in rural America, as I do? Pastors come and go with predictable regularity. A 5-year pastorate is almost unheard of. When the pastor resigns (for various reasons), some mourn but most are benumbed. They expected it, after all. Where is the closeness between people and leaders? Would you trust someone from outside your community to stay around when the going got tough? If, on the other hand, they purchased a home of their own and took up secular employment and led by equipping others to do "the work of the ministry," would you trust such men? Would you feel they were part of you? Would you fear them leaving? I've said it before but it bears repeating: Leaders with a good track record of spiritual maturity must be recruited from the people. Why should that be so difficult to see? Why are we so blind? Why are we not teaching this in our Bible schools? "... so that their congregations knew them and their fathers and their grandfathers and rallied around them as though they were relations." This can be said of the deacons in our country churches. Why not the overseers? This is how Paul appointed leaders. Have we forgotten the importance of mimesis? I draw great courage from the fact that a new generation of Christians is awakening to Jesus’ call to a sacrificial lifestyle. I have begun to witness a major paradigm shift from cultural Christianity to radical discipleship. It appears that God is raising up a group of Jesus-followers who understand that regardless of what we believe on secondary and tertiary issues, evangelicals need to start acting like Christians if we are to build the kingdom of God among every people of the world. There seems to be a growing realization that every member of Christ’s Body needs to be involved in kingdom work, not just paid professionals. This will not happen unless we face our own materialism and even laziness, unless we deliberately choose to live more simply so that others may simply live. I believe it is time for repentance from selfish ambition and vain conceit. Following Christ means taking seriously His call for an exclusive and costly attachment to Him. This is because Christianity is not a religion or a denomination or a church organization. It is a new society living out the ethics of the kingdom of God. It is a radical, Christ-centered, martyr movement. I was inspired to post it by brother Lionel's latest inspirational blog entry: Cutting In Line To Serve. Thank you, brother! He is such a beautiful baby. I am having our church secretary print his picture so we can have a visible reminder of the one we are praying for. I thank you for your perspective on your ministry to Aberesh. It is so good to be reminded of our privilege and place in the Lord's ministry, and how we are to view it all - for His Kingdom and glory. All of this is a reminder to me that there are vast multitudes of children in Ethiopia whose basic medical needs are scarcely met. May the Lord lay on our hearts the burden to do whatever we can to meet the temporal needs of these precious children even as we seek to share with them the Savior's love. My hope is in God, and He will provide. 10:39 AM Since I have so much "spare time" on my hands now (hee, hee), I've begun a revision of my book Why Four Gospels? In it I make a brief observation in passing that although the earliest believers in Jesus continued to meet in the temple for prayer, they also felt a need to meet "from house to house." Why? To observe the meal the Lord Jesus had uniquely bequeathed to them on the night He was betrayed. I'd like to flesh this out a little more and see how the synoptists treated that pericope. One thing's already clear: if our churches today are to move from cultural conformity to radical Christianity they will need to rethink their repudiation of the weekly observance of the Lord's Supper as a family meal at which their absent but returning Guest is present. "But people will get tired of communion if we have it every Sunday!" Really? Would you say the same thing about the apostles' doctrine? About fellowship? About prayer? You can't have it both ways. Either we are Acts 2:42 churches as a whole or we are not. I think it's a shame to the Body of Christ and especially to its Senior Pastor that the very thing He commanded (not asked!) us to do we put off to a trite once-a-quarter funeral yet we would never think about giving up our ceramic deities. 9:45 AM Becky just talked to one of our sons in Ethiopia. Baby Nathan is deathly ill with malaria in Alaba. I am asking the Lord to spare him out of mercy. Aberesh lost many children in her womb. The only other infant to have survived past delivery succumbed to malaria. Today I am looking directly to God for aid and direction and healing. 9:37 AM Church and state: an ungodly marriage. 9:29 AM I want to welcome my new Ph.D. and Th.M. students who will be moving to Wake Forest in the next few days. What God has done for every student in the past He will certainly do for every believing disciple of Christ today. I pray that your life will be a living demonstration of the reality of Phil. 4:19, "My God shall supply all your need according to His riches in glory by Christ Jesus." Doctoral studies can be an exciting -- and heady -- experience. Please remember that God delights in using weak but yielded vessels -- and brains. May the unsurpassing greatness of the power always be of Him and not of us. 7:41 AM Mark of Theological German reports on his trip to the Prague Bonhoeffer Congress. It's a good report. I had no idea that Moltmann was a POW in WW II. the use of this barbarous weapon at Hiroshima and Nagasaki was of no material assistance in our war against Japan. . . . My own feeling was that in being the first to use it, we had adopted an ethical standard common to the barbarians of the Dark Ages. I was not taught to make wars in that fashion, and wars cannot be won by destroying women and children. For more on Hiroshima and Nagasaki, including the (in)famous "cost-benefit analysis" (American vs. Japanese lives), go here. 6:13 PM The latest biblioblogger of the month is none other than Scot McKnight. Great choice! 4:55 PM Here's a must read: Ethiopia and Roxboro. 4:04 PM The latest addition to our home page is called Ten Timely Tips for Teachable Teachers. You ask, "What in the world do beans have to do with scholarship?" To quote Rom. 3:2, "Much in every way!" You see, I just spent 4 hours picking these beauties. But here's the deal. Over half of them I missed the first time around. I would walk down the row I had just picked and, lo and behold, there were dozens of beans I had missed. And I had just "thoroughly" picked that row! Let me apply that to the study of the New Testament. I may have a doctorate in New Testament and I may have taught New Testament and Greek for 31 years, but I certainly do not feel that I am a New Testament "scholar" any more than I feel that gardening makes me a horticulturist. In fact, I am learning things today about Jesus and the Gospels and the writings of His apostles that I never thought were in the New Testament at all. Oops -- must have missed them the first time around! After all these years of teaching I will tell you the absolute truth: I feel like a child wading on the shore of a limitless ocean when I read my New Testament. I'm not jesting! That's exactly how I feel. I still learn new things every day from the Greek text itself. The term "scholar," you see, implies a level of expertise that few would care to claim for themselves. I certainly don't. At best let people think of me as a New Testament "student." The term student is appropriate, don't you think? After all, that's what Jesus said we were: His mathetai, His "students." To return for a moment to my gardening analogy: I imagine that I work with my hands as frequently if not more frequently than any of my readers -- gardening, animal husbandry, slaughtering and butchering our own animals, raising and selling crops, building fences, etc. All that makes me is just another "farmer" as far as I'm concerned. Ain't no big deal around here where I live. I'm certainly no "agricultural specialist." And as a New Testament student I am no "scholar." How can I be a "specialist" in the New Testament when I know only a tiny fraction of what it teaches? Get it? Paul asked, "Where is the scholar?" (1 Cor. 1:20). Any takers? Not me! In Romans Paul puts it this way: "Don't become like the people of this world. Instead, change the way you think.... 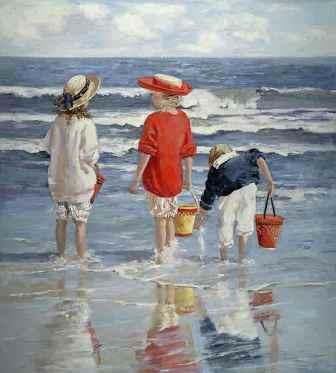 I ask you not to think of yourselves more highly than you should" (Rom. 12:2-3). And he adds this in 1 Corinthians: "Those who think they know something still have a lot to learn" (1 Cor. 8:2). That says it all to me. Like to join me on the shore of that limitless ocean? For the record, I am a strong believer in doctrinal purity. Such doctrines as the virgin birth of Jesus, the authenticity of miracles, and the inerrancy of the Scriptures are non-negotiables for me. I would be the last person to depreciate theology or a proper emphasis on truth. But orthodoxy is incomplete – a disastrous aberration even – without orthopraxy. 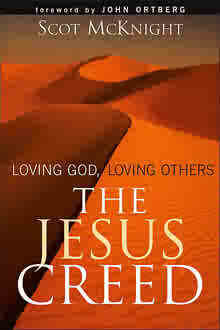 This book emerged from a movement of God in my heart to go beyond proper belief to a new way of living. 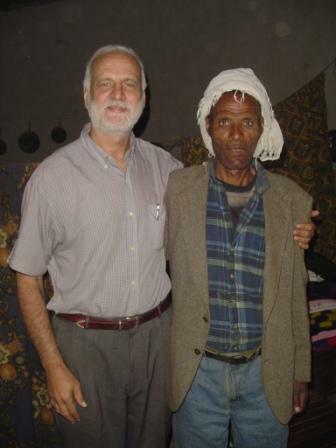 Following in the footsteps of Jesus, I have found myself making the Jesus way of life known in the remotest villages of Ethiopia, the poverty-stricken towns of India, the high-rise churches in South Korea, the offices of Muslim clerics in the Middle East, and the local nursing homes and hospitals where I live. Amid all the debates over Calvinism and the King James Version and the emerging church and worship styles I have come to a slightly different realization: that God is calling out a people who are committed to living lives of genuine obedience to Christ, a community of faith that functions in Christ-like ways – visibly, voluntarily, sacrificially – to show people this thing Jesus called the kingdom. People sometimes ask me whether my doctrinal convictions have changed. Not at all! My convictions haven't changed a bit. It's just that my agenda has expanded. Expanded so wide that it now includes the entire planet in fact. My entire priority system has been turned upside-down and right-side up because of my simple reading of the Gospels and taking them literally and seriously. The manuscript is now in the hands of several readers, friends whom I love and trust and who I know will offer constructive criticism of the book before it goes to press. I look forward to taking their comments and using them to improve the book. It is this tradition, which pauperizes our people, divides the Church, compels us to bow down to Mammon, and makes void the word of Christ, which we must cast aside to-day; for we can no longer pretend that it assists us to keep the word of Christ even at home. We cannot go back and break down the division between the professional clergy and the laity, but we can build a bridge between the two. That bridge voluntary clergy would form. The conception of the Church as one must be recovered by the faithful, not merely accepting a cleric sent to them, but by recognizing themselves as the body of Christ, and finding amongst themselves the best men among them to be their ministers. Then they would know their unity with the clergy, and all men would know it. But perhaps the issue is larger than this. 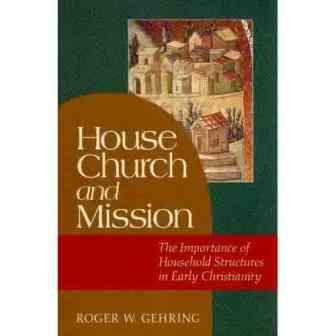 Today I am rereading Roger Gehring's House Church and Mission, particularly the section in which he discusses the meaning of koinonia in Luke 2:42. He says it all has to do with a sense of spiritual connectedness that manifests itself in concrete ways (e.g., a willingness to share one's material goods). He writes on pp. 80-81, "Koinonia signifies here the close connection or relationship among community members, their mutual support of one another, and the empathy and participation in each other's lives. This includes spiritual as well as material considerations. Koinonia implies a God-given unity of heart and mind among the first Christians...." The church, in other words, is a spiritual household, a believing family. Thus everything takes place within the natural context of relationships. So, Allen is correct: turning the ship around involves first of all a realization that we are the body of Christ, a loving family that cares for one another, a group in which leadership naturally rises from "family members," that is, from within (elders all came from their local communities in the early church). Then we need to "find amongst ourselves" the very best men to serve us as overseers, so that we would know we are one (as Jesus prayed) and so that the world too would know that we are a people bonded together in Christian love. I believe anyone who is thinking about such matters would benefit greatly from reading both of these books. The best thing about them is that they are constantly turning our minds to the Mind of Christ and His Scriptures. 7:43 AM Here's the latest installment of Alan Knox's "Scripture ... As We Live It." Right on, brother. By the way, mutual participation has enjoyed a long history in Baptist life. According to Wayne E. Ward, "The Worship of God," The People of God: Essays on the Believers’ Church, eds. Paul Basden and David S. Dockery (Nashville: Broadman Press, 1991) p. 68, the first Baptist churches in England "were trying to restore the primitive apostolic form of the church, and, with unerring logic, they understood that worship must be an outward expression of their ecclesiology. Since the 'gathered community of believers' was their basic concept of church, all forms of worship, including baptism, the Lord’s Supper, prayers, hymns, Scripture exposition, confession, and receiving forgiveness, involved full congregational participation." This seems a far cry from the spectatorism so prevalent in Baptist churches today. I say as much in chapter 4 of my new book, "The Priestly Kingdom: Communal Ecclesiology and Every-Member Ministry." 7:15 AM I use this quote in my chapter, "The Community of the Spirit: Leadership Jesus' Style." Isn't it great? Leadership is only worthy of allegiance when the led freely grant it to the leader in response to the leader’s servant posture. It's from Donald Kraybill's The Upside-Down Kingdom (Scottsdale, PA: Herald, 2003) p. 238. When Nathan wants to move our cattle and goats from one pasture to another, know what he does? Walks in front of them. They simply follow. No sticks. No force. They love and trust him so much they follow him anywhere. Man, farming is so rich in biblical analogies! 6:42 AM Today I'm heading to campus to get some writing done and check my mail. Also will be gearing up for a Bible conference in North Wilkesboro, NC, this Friday through Sunday. I'll be teaching on the subject, "How to Study the Bible." Becky will be coming along. Should be great fun. And if you live in the Dallas-Houston corridor, B and I will be heading out your way shortly to speak in several churches about Ethiopia. More details to come. 6:34 AM Ach, the problem with monolingualism. Speaking of which, here's a free online monolingual German dictionary: Das Digitale Wörterbuch der deutschen Sprache des 20. Jh, or DWDS for short. Of course, one of my goals in life is to help people become less monolingual. 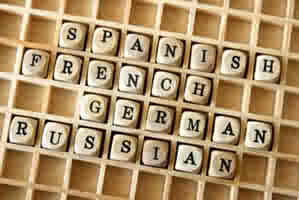 One of the great distractions in learning a foreign language comes from the fact that it is done consciously. Then we become nothing more than walking dictionaries. Fluency -- now that's the goal! 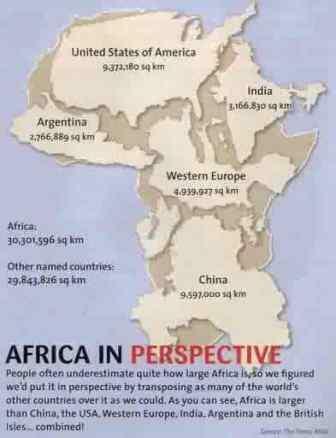 More than 680 million people live in Africa, and that number is rapidly expanding. The population of Ethiopia is now over 70 million (it was 50 million in 1990). Ethiopia has one of the highest fertility rates in the world — 5.4 children per woman. Decades of rapid population growth have contributed to over-farming and deforestation, which have degraded the environment. Only 46 percent or less of the population of Ethiopia live within a reasonable distance from health care facilities. What a need! What an opportunity! Stay tuned for an update on the Galana health clinic that we are refurbishing in southern Ethiopia. Our Lord is doing an exciting work there. 8:10 PM Alexander Solzhenitsyn is dead. 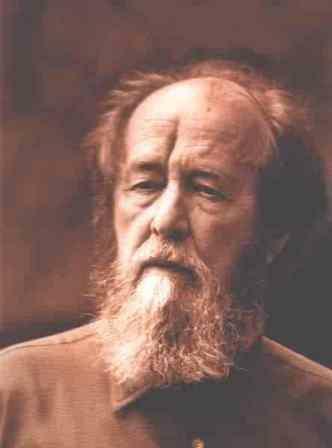 When Solzhenitsyn delivered the 1978 commencement speech at Harvard, one newspaper said, "Prophets are not popular. They are uncomfortable people; they make poor house guests. Not only are they not honored in their own countries but sometimes not even in their own times. The greatest of them have been labeled as arrogant, self-righteous, presumptuous, unpatriotic." How very true. I mention this to encourage all you modern-day Jesus followers who gladly risk unpopularity to follow the downward path in order to make the Jesus way known. Don't let it discourage you! 7:15 PM A huge shout out and thank you to my students at the Harvest Institute in Knoxville. You were a GREAT class! Thanks for putting up with me for a whole week. Maybe we can do Greek together next spring or summer. That would be fun! I was able to show some slides of Ethiopia at the Trinity Hills assisted care facility. Afterwards I was introduced to the former dean of the Johnson Bible College in Knoxville, who said I should visit the college while I was in town. I sure am glad I took him up on his suggestion. And who did I happen to run into on campus? Rafael Rodriguez, their professor of New Testament and Greek! Rafael, what a pleasure getting to know you. I look forward to reading your Sheffield dissertation when it's published. And thanks for using my beginning grammar in your classes at the college! FYI, Rafael blogs here. The big event of the week was, of course, Sheba's litter. Here's mama and her five babies. They are SO SWEET. And Sheba is a great mother. I think she was happy to see me. I know I was happy to see her and the pups! Guess what else? I managed to complete my book manuscript, including the preface and even the dedication (guess who!). That's exciting. Right now I'm exhausted. Time to chill out and do NOTHING!